30 Ways to Have Some Computer-Controlled Evil Fun! "e;The steps are easy to follow...text is precise and understandable...uses very clear pictures and schematics to show what needs doing...Most importantly these projects are fun! "e;--Boing Boing This wickedly inventive guide shows you how to program and build a variety of projects with the Arduino microcontroller development system. 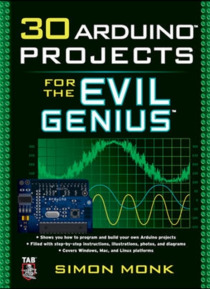 Cove… ring Windows, Mac, and Linux platforms, 30 Arduino Projects for the Evil Genius gets you up to speed with the simplified C programming you need to know--no prior programming experience necessary. Using easy-to-find components and equipment, this do-it-yourself book explains how to attach an Arduino board to your computer, program it, and connect electronics to it to create fiendishly fun projects. The only limit is your imagination! 30 Arduino Projects for the Evil Genius: Features step-by-step instructions and helpful illustrations Provides full schematic and construction details for every project Covers the scientific principles behind the projects Removes the frustration factor--all required parts are listed along with sources Build these and other devious devices: Morse code translator High-powered strobe light Seasonal affective disorder light LED dice Keypad security code Pulse rate monitor USB temperature logger Oscilloscope Light harp LCD thermostat Computer-controlled fan Hypnotizer Servo-controlled laser Lie detector Magnetic door lock Infrared remote Each fun, inexpensive Evil Genius project includes a detailed list of materials, sources for parts, schematics, and lots of clear, well-illustrated instructions for easy assembly. The larger workbook-style layout and convenient two-column format make following the step-by-step instructions a breeze. In December 2011, Arduino 1.0 was released. This changed a few things that have caused the sketches for Projects 10, 27, and 28 in this book to break. To fix this, you will need to get the latest versions of the Keypad and IRRemote libraries. The Keypad library has been updated for Arduino 1.0 by its original creators and can be downloaded from here: http://www.arduino.cc/playground/Code/Keypad Ken Shiriff's IRRemote library has been updated and can be downloaded from here: http://www.arduinoevilgenius.com/new-downloads Make Great Stuff! TAB, an imprint of McGraw-Hill Professional, is a leading publisher of DIY technology books for makers, hackers, and electronics hobbyists.